Interesting article from The Economist regarding White Cane alternative. FOR centuries, canes have served blind and partially sighted people well by giving them a means to negotiate the world around them. The only serious upgrade they have undergone dates back to 1921, when a Briton called James Biggs, who had recently lost his sight, painted his own cane white in order to make it easily visible and to alert others to the presence of someone unable to see nearby obstacles. In the opinion of Daniela Rus of the Massachusetts Institute of Technology (MIT), however, the white cane has had its day. Dr Rus would like to replace it with a system that scans its user’s environment and communicates back to him what it sees. 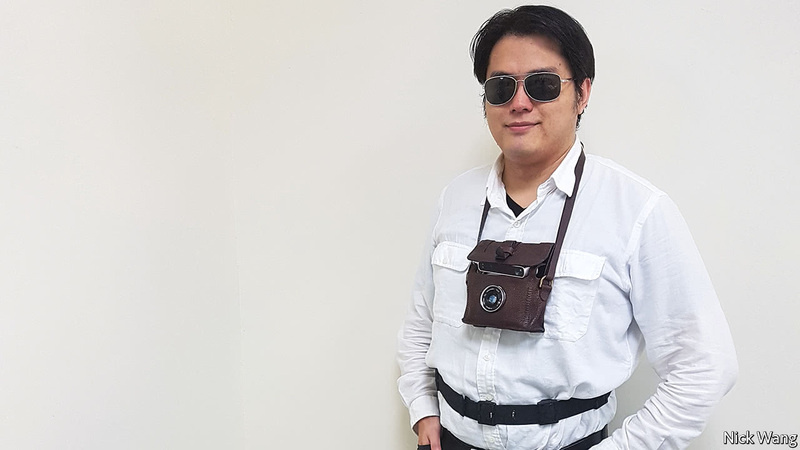 Dr Rus’s device, of which she demonstrated a prototype on June 1st at the International Conference on Robotics and Automation in Singapore, consists of a camera worn on a lanyard around the neck, and a belt. A computer inside the camera creates a three-dimensional image of the area ahead of the wearer, processes it to extract relevant information, and uses the results to pass on appropriate signals via the belt. Dr Rus knew from previous attempts to build devices of this sort that what might seem the obvious way of manifesting those signals, namely as sounds with specific meanings, was not, in fact, a good approach. Blind people depend a lot on their hearing and do not like it when newfangled devices hamper this sense with beeps and clicks. Hence the belt, which has five vibrating motors installed in it. One sits over the centre of the wearer’s abdomen. The others flank this central motor, with two spaced out on either side of it. That configuration permits the computer to warn a wearer when he is on a collision course with an obstacle. It does so by telling the motor pointing most closely in the direction of the obstacle to vibrate. If the wearer is walking towards a wall, for example, the central motor vibrates softly when he comes within a couple of metres of it. If he ignores this, perhaps because he actually wants to reach the wall, the computer increases the amplitude as he closes in, giving him a good idea of exactly how far away he is. Similarly, if he is in danger of bumping, say, his right shoulder on a door frame while walking from one room to another, the right-most motor on the belt will warn him of the impending collision. And it works. When compared with navigation by white cane in one of MIT’s famously crowded hallways, it reduced blind students’ collisions with others by 86%. The new system can, however, do more than just help someone walk around without collisions, for the belt incorporates a touchpad that is inscribed with instructions in Braille. This permits the user to program it to perform specific tasks. For example, Dr Rus knew that blind students often struggle to find an empty seat in a crowded lecture theatre. Adding an appropriate algorithm to the computer’s software helps get around this by enabling it to recognise chairs, and also whether or not a chair is occupied. In this case, the motors are used to indicate a direction to be travelled in, rather than one to be avoided. Activating the algorithm using the touchpad causes the motor pointing most closely towards an empty chair to vibrate when the system spots one. In trials involving a room that contained an empty chair, an occupied chair and also a recycling bin, the algorithm directed the belt-wearer straight to the empty chair 80% of the time. Cane users presented with the same arrangement always found the empty chair eventually, but in doing so came into contact with objects other than their target more than five times as often as those using the camera and belt. Whether a camera (ideally, smaller than the one in the prototype) and a belt could replace a cane completely remains to be seen. In particular, Dr Rus’s system does lack one important feature of Biggs’s innovation. A white cane not only helps a blind person to navigate, it also signals his condition to the rest of the world, allowing others to adjust their behaviour accordingly. As a supplementary aid, however, her approach seems most promising.